We Are In The FELABRATION Week: Read All About The Nigerian Annual Ceremony. WELL, THE VERY POPULAR ANNUAL CEREMONY “FELABRATION IS STARTING TOMORROW AND T.I.N MAGAZINE HAVE DECIDED TO SHARE WITH NIGERIANS WHAT IT IS ALL ABOUT. Felabration is our annual festival of music and arts commemorating the life and times of Nigerian’s foremost musical icon, the late great Fela Anikulakpo Kuti. As a music brand, it’s revered and highly influential. The idea and concept of Felabration as an annual celebration of Fela’s music, life and times, originated from his eldest child Yeni who conceived it in 1998. INCASE YOU DON’T KNOW FELA READ: Music Legend FELA ANIKULAPO KUTI Full Biography,Life And Death. With the exception of 1999, Felabration has taken place yearly. Currently Felabration, organized by the Felabration Organising Committee has grown into a mega week-long musical event in Nigeria which attracts thousands of visitors annually to the New Africa Shrine from all over the world and is an official tourist destination of The Lagos State Government who are major sponsors of the event. Over the years Felabration has attracted many high class musical acts from all over the world. The roll call include Hugh Masakela, Femi Kuti, Lucky Dube, Awilo, Baba Maal, Les Nubians, King Sunny Ade, Lagbaja, Asa, TuFace, Seun Kuti and many others. In 2008, over 50 international artistes came together from the United States, Great Britain, France and Senegal to perform at Felabration under the banner, African Express. Every year Felabration features exciting line ups of artistes designed to whet the appetite of music lovers. Felabration has been attended by almost every Nigerian artist who respects the music industry. They show up every year and perform their bests on stage. Big artists like; Olamide,D’banj,Ice Prince, Don Jazzy, Psquare, Davido and many more others!! The Felabration Week always runs through the week of October that includes the 15th ensuring that Fela’s posthumous birthday celebrations are part of the Festival. As the creator of afrobeat, social critic, political activist and champion of the underprivileged as well as a philosopher of his own political ideologue, Fela is still today a hero to millions for his contributions to society. Our festival in his honour always attracts a huge loyal following. Every year Felabration attracts over 100 artistes both locally and internationally. Our festivals always include various creatively diverse activities. ‘The Fela Debates’, symposium series, the secondary schools debate for schools in Lagos State, Dance Troupes, Photo Exhibitions, The Fela Street Carnival Parade with musical floats and costumed dancers The Fela Week Partners events and much more. We offer an exhilarating week-long festivity celebrating the iconic status of Africa’s best known musical figure, and best of all, it remains mostly free! 2015 FELABRATION KICKS OFF TOMORROW! It is that time of the year again, as the 2015 edition of Felabration, a celebration of the music heritage, life and times of Fela Anikulapo-Kuti comes in full swing on Monday, October 12. According to the organisers, the annual international music festival will parade a variety of music stars from within, and outside the country. Some of the acts slated to perform are, Third World: An international reggae group and the Newen Afrobeat Band from Chile. Also likely to perform is Lauren Hill, and a host of A list Nigerian musicians. With the theme, Just Like That, this year’s edition officially kicked off with a debate for secondary schools on Tuesday, October 6 at Freedom Park, Lagos Island. Public and private schools alike slugged it out as they debated the topic, Poverty Is Not An Accident, a quote made famous by the late Nelson Mandela. The NECA building at the Central Business District, Alausa will host the annual Fela Debates symposium. The topic for this year, Human Rights is my Property, will be moderated by the immediate past governor of Lagos State, Mr. Babatunde Raji Fashola. Also speaking will be Sandra Izsadore, who was instrumental to redirecting Fela’s music perception from American styled Jazz to the Rhythms of Africa, Afrobeat. 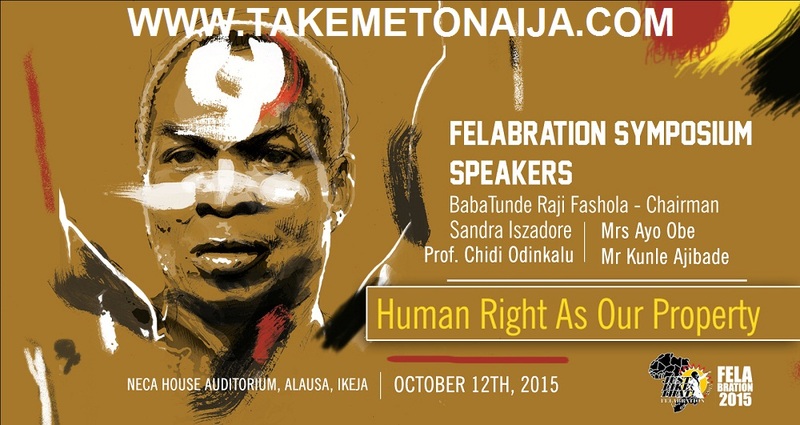 Also speaking will be Prof Chidi Odinkalu of the Nigeria Human Rights Commission, Mr. Kunle Ajibade. Journalist; and renowned human rights activist; Mrs. Ayo Obe. From Monday October 12, the festival’s official home, the New Afrika Shrine, will come alive later that night, with the first batch of performers taking the stage. The events will run from Monday till Sunday 18 October, with daytime carnivals and road shows on major streets in the Lagos axis.